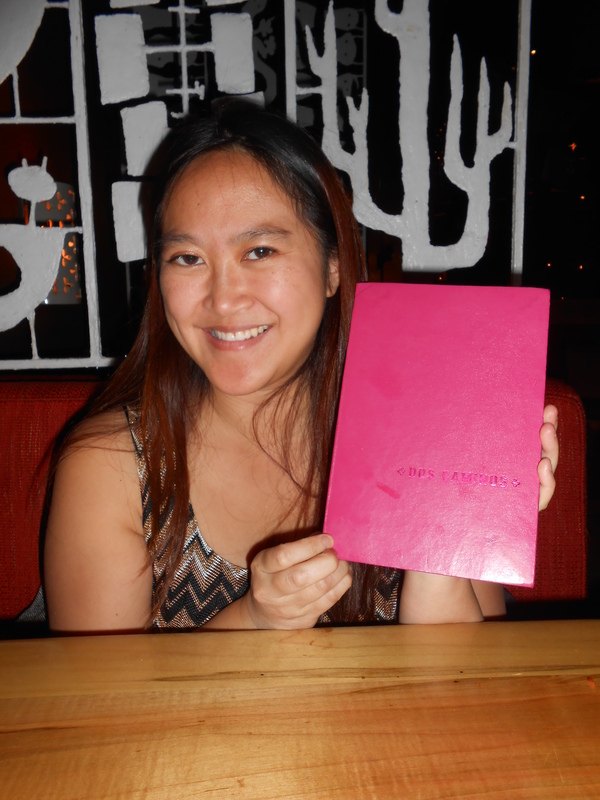 I’ve been wanting to dine at trendy Mexican restaurant, Dos Caminos since forever so I was happy to have the chance to do so tonight at the Park Avenue South location. It was a nice, cozy spot with cushioned seats. Upon the recommendation of my friend, I had the Jamaican Lemonade — which is lemonade with lime juice and syrup. It was both tart and sweet as well as refreshing. 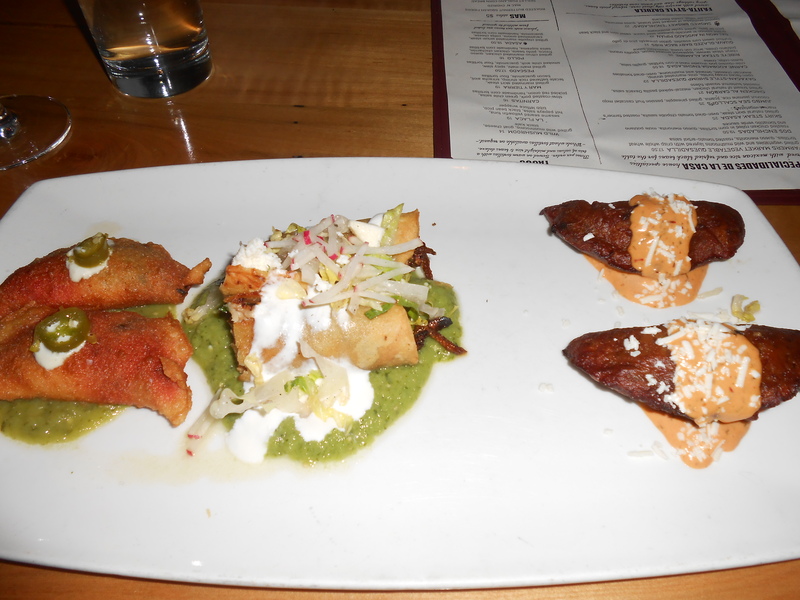 My friend and I shared the Dos Caminos Bocadito Trio, which consisted of chicken taquitos, quesadillas and plantain empanadas. The taquitos were my favorite – I enjoyed that taste of crispy chicken and crunchy wrapped shell, as it should be (some Mexican restaurants call tacos taquitos). The mexico city street quesadillas were pretty good with shredded pork but looked and tasted more like empanadas. The plantain empanadas were just okay- The soft interior combined well with crispy exterior and I did like the sauce it came with. 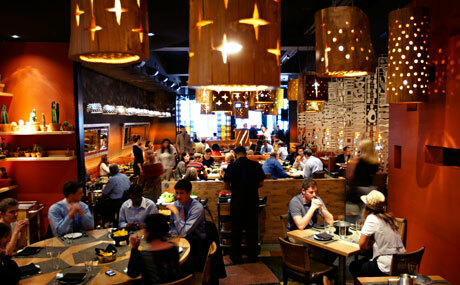 As for the entree, I had a tough time choosing between the prickled pear short rib special with squash & brussel sprouts or the baby back ribs with truffled sweet corn and pineapple. I ultimately decided on the baby back ribs, but I think the short ribs would have been the more interesting and unique dish. The entrees came with spanish rice and beans. 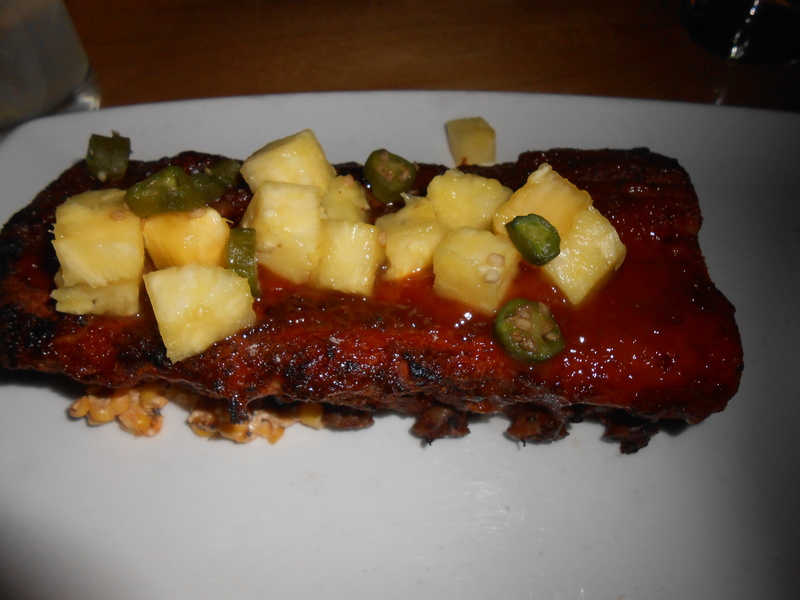 The ribs were guava-glazed and had a wonderfully sweet flavor. The meat was tender, coming right off the bone and slightly burnt at the ends which is how I like it. The truffled sweet corn esquites were good… They were underneath the ribs and a mash of sweet corn, mayonnaise, crumbled cheese and some kind of red powder all mixed together. My friend ordered the fish special with peppers. I actually really enjoyed his dish. It was light and tasted delicious. 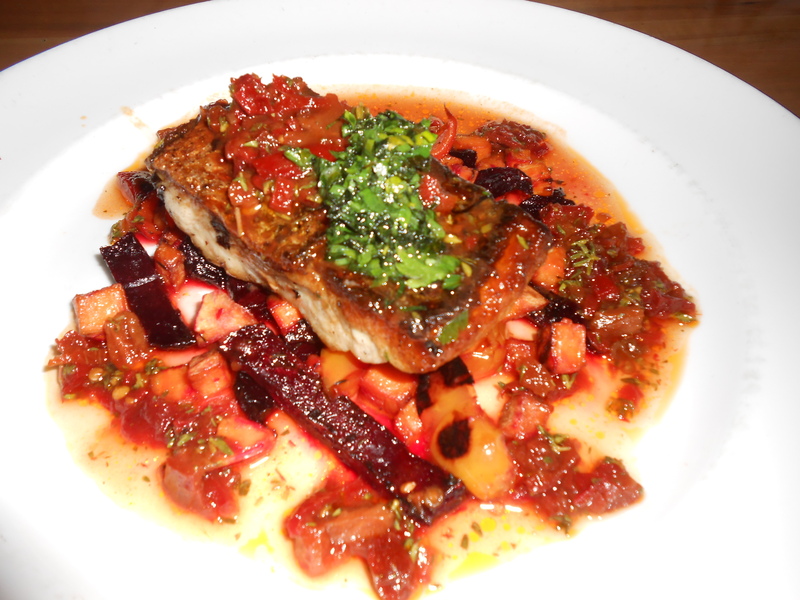 I liked the crispiness of the crust and the flavor of the fish itself. The peppers were soaked in some kind of sauce and balanced the dish. We decided to try dessert as well and settled on the Mexican Hot Fudge Brownie Sundae to share. The sundae came with vanilla bean ice cream, warm churros, chocolate covered cocoa mini brownies, as well as hot fudge and butterscotch sauces. 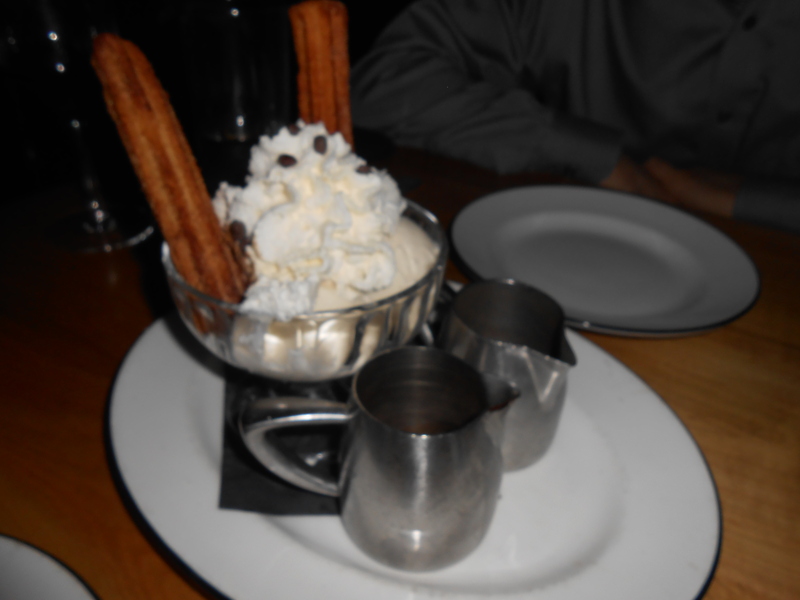 We poured both sauces over the sundae and it was delectable… Sweet, rich, creamy flavors all mingling together and the churros were fried to perfection. The churros were even better when dipped in some butterscotch sauce.